The Missouri State Bears did not score a field goal in the final 7:28 and let a tie game get away from them in the final two minutes Friday night in a 73-63 MVC Tournament Quarterfinal loss to Wichita State at Scottrade Center. In a game with 13 ties and 16 lead changes, the Bears (20-12) looked like they would find away to win the third meeting between the two club this season after losing the first two games by a combined five points in the regular season. With 7:28 to go, Keith Pickens knocked down a three-pointer for MSU to give the Bears a 54-52 lead. A minute later, Will Creekmore hit a pair of free throws to put Cuonzo Martin’s squad on top by four. The Shockers (24-8) scratched their way back and retook the lead briefly on a driving layup by Clevein Hannah with 4:05 to play. Howver, Kyle Weems retaliated for MSU with a pair of key free throws on the Bears’ next possession. The back-and-forth battle continued over the next two minutes as the game turned into a free-throw shooting contest. Jermaine Mallett and Creekmore each made one-of-two shots in charity-line opportunities over the next minute. With 1:11 to play, WSU held a narrow 62-61 lead, but that’s when the wheels seemed to come off for Missouri State. Wichita State sophomore Garrett Stutz converted a traditional three-point play with 51 seconds to go, fouling out Mallett and putting the Shockers up 65-61. When Adam Leonard drove to the basket on the next MSU possession, he was hammered from behind by J.T. Durley, springing a loose ball to Shocker junior Aaron Ellis. Ellis found Toure Murry down the floor, and when Weems challenged his shot, he was called for an intentional foul with 30 seconds to go, his fifth personal. The Shockers, the No.2 seed, would go 6-for-6 at the line from there, and added an exclamation point on a run-out dunk by Kenny Manigault in the final seconds to hang on for a 73-63 win. The seventh-seeded Bears suffered their third-worst defeat of the season by the final margin, but committed just eight turnovers and outrebounded the Shockers by a 32-28 margin, including 14 offensive rebounds. 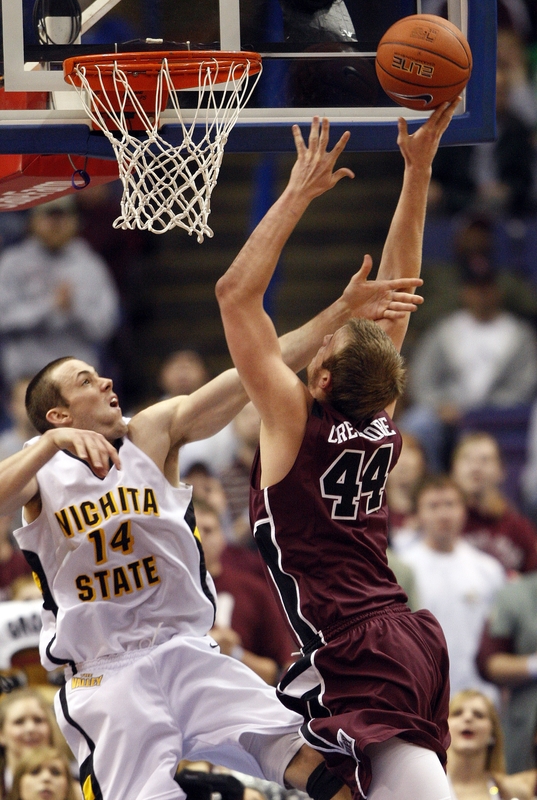 Mallett had a team-high 18 points for Missouri State, while Weems added 17 points. Creekmore was high rebounder with a game-high 8 boards.